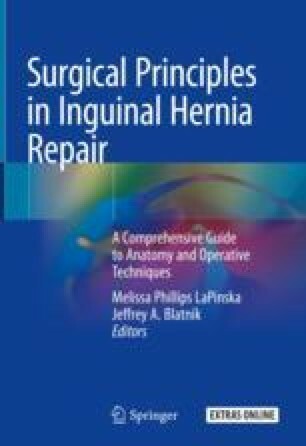 Chronic inguinal pain after inguinal hernia surgery may cause significant morbidity. Prevention is the key to avoiding this condition, but if encountered, surgical approaches may play a role in remediating this pain. Intervention should be reserved for refractory cases only after an exhaustive multidisciplinary workup, management with pharmacologic and behavioral therapy, and interventional procedures with nerve blocks or ablations. Review of prior operative technique, history and presentation, physical exam findings and dermatosensory mapping, imaging, and response to interventions guide consideration for neurectomy and mesh removal. Inguinal neurectomy involves resection of the three nerves generally involved in the development of postoperative inguinal pain: the ilioinguinal, iliohypogastric, and genital branch of the genitofemoral nerves. Open and laparoscopic selective and triple neurectomy, meshoma removal, repair of recurrence, and paravasal neurectomy for orchialgia have been found to provide relief to patients suffering from chronic inguinodynia. These operative interventions should be considered in carefully selected cases of chronic post-inguinal herniorrhaphy pain.